Understanding the source of current and emerging risks can be a difficult proposition. Our business environment is constantly changing, meaning there is increased pressure in operational processes. Performance is often evaluated by reviewing reports from one or two months ago. However, in reality, current performance and trends in each operational area may be very different from that of last month and reviewing historical data from incident management, technical or FDM systems may not be enough to ensure clarity and end-to-end risk management. An effective SMS Information Management solution enables continuous improvement and proactive management of risk. 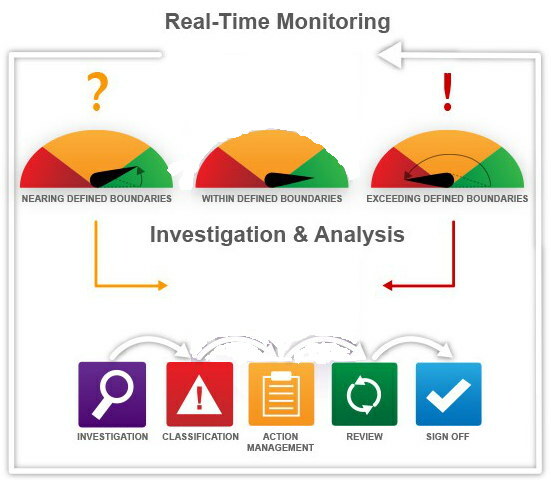 The solution transforms performance monitoring from reactive to proactive, by providing real time trend analysis of KPI/SPI levels across multiple data systems. The system monitors and detects when a value is either approaching or exceeding a boundary at a defined point and automatically packages the information, with relevant details as a trigger message, into the SMS Information Management solution as an occurrence report. The occurrence report will identify the severity of the exceedence. Any contributing incident reports or other technical or operational data will assist in assessing and justifying the severity of the exceeded boundary. At this stage the occurrence report will be reviewed to determine if an investigation is required. An investigation is initiated using a pre-defined workflow which ensures that the appropriate actions and ownership is distributed through the organization. A SMS Information Management solution collects diverse data from across various systems, organizes the information, automates corrective actions and investigations and then provides a continual feedback loop for processing information which truly transforms performance monitoring and proactive risk management.